As 2011 begins, I am hoping for many fascinating submissions to become part of McIlvainea. To start off the year, I have an engaging lead article about Bondarzewia mesenterica by Jonathan Frank of Southern Oregon University in Ashland Oregon. He explores not only the taxonomic issues of this rare species but has found Bondarzewia mesenterica to be a delicious edible that he has been able to successfully cultivate. The second article is the annual report of the NAMA Toxicology Committee describing the poisoning incidents reported in 2010. This will be followed by the Voucher Committee report for the 2009 NAMA foray at Lafayette, Louisiana hosted by the Gulf States Mycological Society and the 2010 NAMA foray at Winter Park, Colorado hosted by the Colorado Mycological Society. McIlvainea accepts articles throughout the year. If you have an idea for a paper or are willing to review articles submitted for publication, I would love to hear from you. Instructions for authors can be found on the NAMA website, www.namyco.org. Submissions are reviewed. Once accepted, articles are promptly published on line. 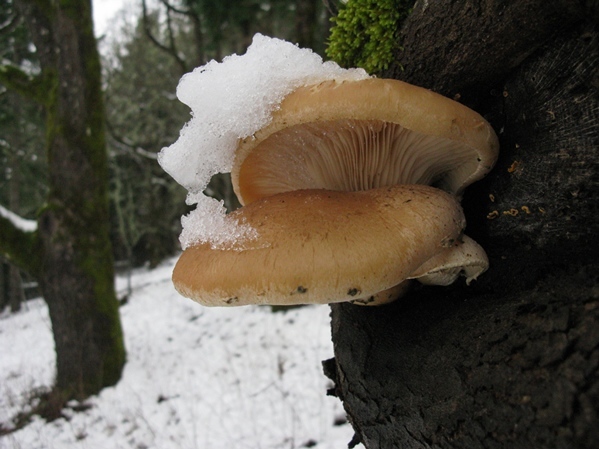 My own interest has turned to the study of mushrooms in specialized local habitats. In the late spring and early summer I follow the snow banks up the slopes of Mount Adams in pursuit of Snow Bank fungi. This year I made dozens of collections of Cortinarius species and found two species of Ramaria and a gastroid Pholiota never before reported from Washington State. Then in November, when my vineyard and winemaking activities slow, mushrooms are just starting to appear in the Oregon White Oak (Quercus garryana) groves on and near my farm. The cover photo on this issue shows Dr. Joe Ammirati holding an unnamed Cortinarius from an oak grove a short walk from my house. His basket is filled with about a dozen other oak-associated Cortinarius species waiting to be classified. I managed to collect two apparently new Russula species and one apparently new Lactarius species from under the oaks as well. I have talked a Russula specialist into helping to get names for the Russulas and am still looking for someone who wants to tackle the Lactarius. I look forward to the day when these pursuits mature into papers for McIlvainea. Have you already been observing mushrooms long enough in your own neighborhood to write an article for McIlvainea? Just being out in the same area week after week can lead to interesting insights. 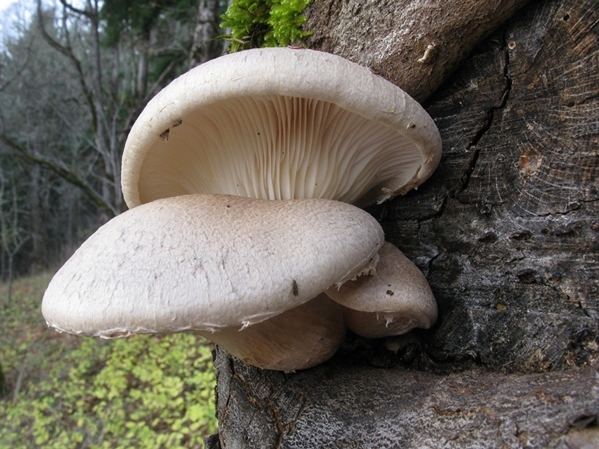 There are the mushrooms that come and go in a day or two and then some fleshy fungi linger for months. In October, I watched a Pleurotus dryinus start to form on an oak limb outside my bedroom window and then photographed it in mid-November. On Christmas day, after three snow storms, it was still looking good (see photos below). By February 1, it was a sad remnant of its former glory, yet it was still hanging on in late March. While I had long known that Chanterelles live for months, I had never dreamed that a Pleurotus was also capable of fruiting for months and still could look good long after a week of temperatures in the teens. Send manuscripts to Michael W. Beug, PhD, PO Box 116, Husum, WA 98623; or by email to beugm [at] evergreen.edu.